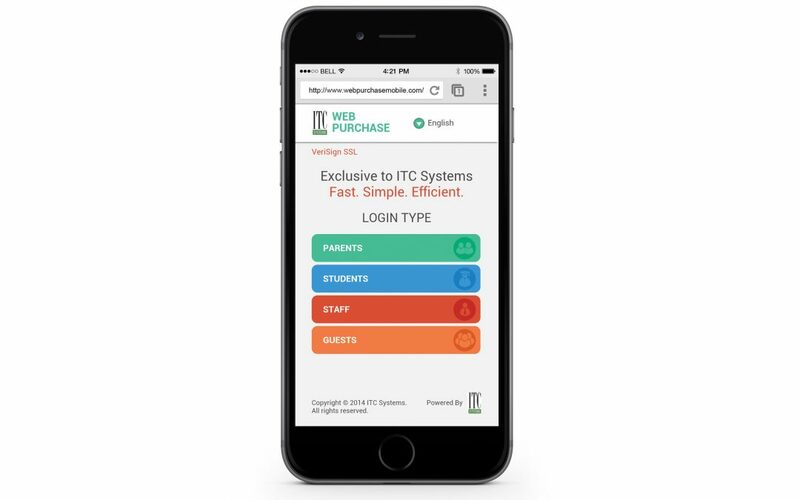 October 15, 2014 – Toronto, ON—ITC Systems announced today the release of Web Purchase Mobile, an account management platform that allows students, parents, staff, and guests to use and manage their one card account over the web on a PC or mobile device. “We’ve invested a significant amount of time and effort into the development of Web Purchase Mobile,” says ITC Systems President and CEO Campbell Richardson. “This is a particularly intricate platform and our developers have been dedicated to ensuring that it is fully aligned with the high expectations our customers have of the ITC Systems product line. Web Purchase Mobile allows students and other authorized users to quickly and easily review their one card account balances and it allows them to purchase meal plans, events, or privilege programs such as parking plans. The platform allows for the use of credit cards, online debit or PayPal accounts. It is fully integrated with Multiplan, the ITC Systems’ campus card management software, and it allows users to monitor their account activity and balances in real time using a computer or a mobile device. The interface works with iOS, Android, Blackberry and Microsoft operating systems. Configurable login methods enable an institution to define the authentication for each user profile, while users can set a PIN to protect the usage of their cards. This PIN can be modified anytime using Web Purchase. If a card is lost or stolen, users can suspend their accounts via the web to immediately protect their funds. For more information on Web Purchase Mobile, please contact sales@itcsystems.com.